A version of this story appeared in WRAL Tech Wire on February 25, 2014. Editor’s note: Grace Ueng, CEO of Savvy Marketing Group, advisor to the founders of NCCBA, and known in Triangle circles as “Chinese Oprah,” hosted a recent chat with YanChing Zhang, NCCBA co-founder; Paul Chou, entrepreneur and philanthropist, founder of Junior Achievement China; and Michael Jacobs, CEO of Jacobs Capital and Professor of the Practice, UNC Kenan-Flagler on the following topic: “Past, Present, and Future Perspectives on China: Building the Bridge with the U.S. and North Carolina.” In a three-part series for WRALTechWire, Ueng interviewed the three executives at length about the challenges and opportunities in doing business in and with China. The presence of Lenovo, which was founded in China, in Morrisville and the growing links between the Triangle and China have been demonstrated recently by Epic Games’ sale of 40 percent of the company to Tencent and Smithfield Foods’ acquisition by a Chinese firm as well as Duke University’s expansion to China. 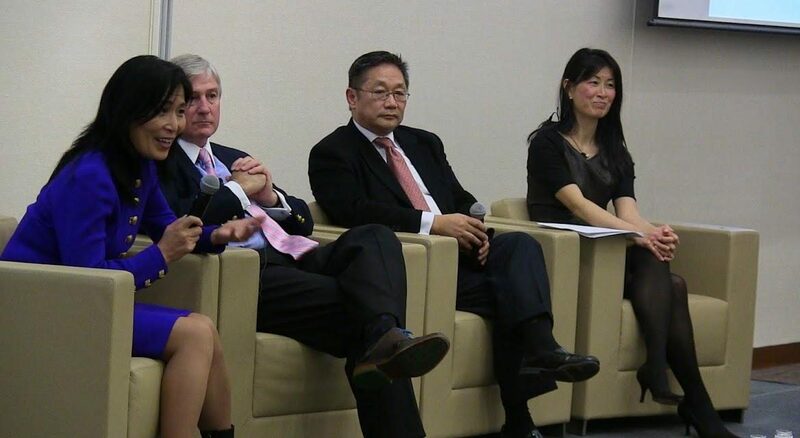 RESEARCH TRIANGLE PARK, N.C. – The North Carolina Chinese Business Association (NCCBA) hosted a standing room-only-crowd, which was served a pleasing traditional Chinese feast, after which was followed a luminary panel discussion at the Research Triangle Foundation earlier this month to ring in the Chinese New Year of the Horse. The large audience who turned out even in a rain drenched evening demonstrated the intense and growing interest in NC-China relations. About half of the audience hailed from China with the balance being those born in the U.S. who are currently doing business in China or soon hope to be. NC-headquartered corporations with significant operations in China such as Cree and Lenovo were in attendance as well as entrepreneurs and non-profit leaders. Faculty, administration, and students from Duke Fuqua School of Business, Duke Kunshan, UNC Kenan-Flagler, and Wake Forest University School of Business were also represented. Michael Jacobs, the guest speaker sharing the newest viewpoints on China, traveled to teach in Beijing this past summer. The audience hung on to every word of wisdom dispensed by the dynamic discussion among the guest speakers. And when the end of the evening came, the throngs of the audience staying to catch a few words with YanChing Zhang, an NCCBA co-founder, Paul Chou, an entrepreneur and philanthropist, Jacobs, and myself for nearly two hours was indicative of their strong interest in the NC-China topic. Paul reflected that the question took him back to a 2008 economic forum in Shanghai. At that meeting, Henry Kissinger asserted that the world’s economic future belonged to China and America because Europe still hadn’t determined whether it was a single entity or a loose association of member states and the lack of clarity would hurt the geography’s competitiveness for years to come. Lastly, and perhaps most importantly, do not forget the importance that building strong personal and business relationships based on trust and integrity play in having a successful career. This is more than my advice, it’s not optional, it’s mandatory. One audience member who asked what Jacobs and Chou immediately said was a “brilliant” question was Katrina Wertz, a Class of 2015 Morehead-Cain Scholar at UNC Chapel Hill majoring in business administration and minoring in Chinese. 1. Lesson number one – you never know who you may walk in with! That evening, I had walked in with Katrina and we quickly learned what we had in common: UNC Kenan-Flagler where I have taught in her field of concentration – Entrepreneurial Studies. And of course, our shared interest in China. 2. Government Relations: China vs. U.S.
“My No. 1 take-away is that there is a disconnect between perceived cultural reasons why Chinese have difficulty doing business in the U.S. and practical reasons for the difficulty – that they have failed to adopt common U.S. business practices and retain U.S. talent in their U.S. operations. An eye opening phrase I heard, albeit a difficult one for some to admit, was Paul saying “blaming ’cultural differences’ is a cop out. YanChing touched on this as well when she talked about how U.S. companies that want to either sell in China or manufacture in China will need to partner with local companies or individuals to be effective, because doing business is so different in China. I think most would find that very intuitive. It appears, however, the same dynamic is true in reverse, but since the U.S. is an “open” or “free” economy, I wonder if the need for local help is perceived to be less important. Since you need government approval to open a factory or sell products in China, U.S. companies are more likely to realize the need for local assistance. But since anyone can open a factory or sell products in the U.S., I wonder if perhaps many Chinese businesses feel they don’t need the local help as badly, and they fail to realize that merely having the ability to operate has virtually no impact on success in the U.S. because everyone has it. 4. How Students learn in China vs. the U.S.
That is the method Ueng, like Jacobs, a graduate of Harvard Business School where this method including the cold calling made famous in “The Paper Chase” prevails, both leveraged in their teaching at UNC Kenan-Flagler and in China. There has been staggering growth in the number of MBA programs in China because of the growing demand for hiring local Chinese talent. They include joint venture programs like the MIT-Fudan program I taught, American branded programs like Duke Kunshan as well as home grown Chinese university programs. There are endless opportunities in China to leverage U.S. learnings on business management and Zhang challenged the audience to aggressively seek them out. Chou amplified on this saying that for thousands of years, China was ruled by emperors, the last of which was overthrown in 1911. Thirty-five years of rule by warlords followed, and then in 1936, Japan occupied and that was immediately followed by civil war. Chairman Mao ruled from 1949 to 1979, and then in the thirty years from 1979 to 2009, China became the world’s second largest economy. He asked the audience to think about where China might be in 2039 and the opportunities present for the very people in the room. He said that if you were to ask today’s young Chinese how many of their grandfather’s couldn’t write, a significant number would raise their hands. Jacobs cited two recent events as particularly troubling. The first was China’s refusal to permit partial American ownership of Chinese public accounting firms. The second was the refusal of Chinese accounting firms to respond to SEC requests for information on certain financial statements. How these issues are resolved by the Chinese going forward is incredibly important to accessing the U.S. capital markets. Glenn C. Andrews, President, of Cardinal Capital Management in Raleigh, shared with WRALTechWire, “One of the more interesting portions of the evening for me was delivered by panelist Professor Michael Jacobs as he discussed the difficulties China is having meeting U.S. standards of company disclosure and transparency. His point was that in order to raise capital in the U.S. there will be a need to meet U.S. standards of disclosure and transparency. My firm invests directly in non-U.S. securities including developed and emerging markets. We have circumvented the issue Jacobs cited by investing in companies that are suppliers to the lucrative Chinese economy, but are domiciled in countries with disclosure practices and requirements meeting U.S. standards. Australia, which provides a great deal of raw materials as well as finished and semi-finished goods to the Chinese economy, is a good example. Michael and Paul’s remarks that the accepted belief at the highest levels of the Chinese government that a free market economy was the engine of past and future economic growth were completely new to me. And Yanching’s comments that the government’s awareness that continued growth rooted in a free market as an imperative to its remaining in authority closed the causality loop. Michael Jacob’s closing point that watching it all unfold over the next 20 years would be fascinating was right on the mark. More than anything, however, Paul Chou’s comments regarding the importance of Chinese and Americans giving back to the community shone the brightest.